Now you can share the Shushan Shabot Purim cartoon with your friends on YouTube, MySpace, and Facebook! My friends at PresenTense Magazine have done it again, and released Issue 4 to the public. I am pleased to have a special "Sunday Strip" style Shabot comic — complete with color and longer format — featured as the "Shabot Spot" on page 32. Click to see the full comic strip, "Antisocial Networking", which is about Jews on Facebook. 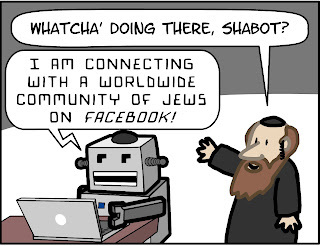 While you're at it, become a Facebook Fan of Shabot, too! Emily Shelton clowns around with her family. Jessica and Hollie put on a Miss Jewmerica pageant.